Vodka has a special place in the BrixChicks's hearts. 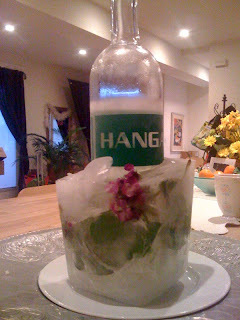 So for this Wine Blogging Wednesday with the door open to write about other spirits, I immediately thought of my favorite Vodka: HangarOne. Let's face it with my deep loathing of all things snow, it would take a whole bottle to get me out in a Winter Wonderland. Plus I would need significant fortification (and specialized footwear) to venture out into snowy climes. In 2001, not a great year to think back on what with the terrorists, dot bomb, etc., etc., but one great thing did happen and that was Jorg Rupf and Ansley Coale got together to bring the exquisite craftsmanship and innovative thinking of their respective efforts together to work on HangarOne Vodka. Pure, clean vodka taste infused with real fruit create lovely sipping vodkas that inspire mixologists everywhere. 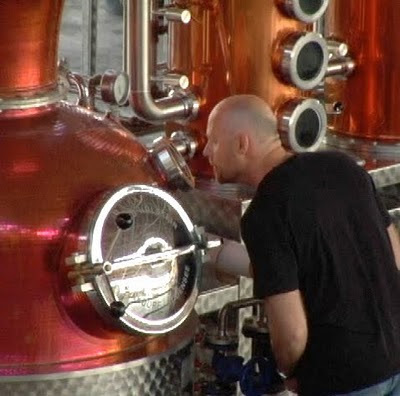 Look at the cool distilling equipment and concentration on the face of distiller, Lance Winters! And back to the snow theme, a super fun thing to do with vodka, is easy and elegant. You can take citrus slices, peppers, herbs, flowers or leaves and insert them in a container that will hold your vodka bottle and a thin layer of water. Put it all back in the freezer and adjust your arrangement, so that when your guests arrive, you can place the vodka bottle on the table without losing the chill. Hint: Spray the container with some Pam before adding decorations or vodka bottle so that you can just grab the neck of the bottle to unmold. Wow! This Wine Blogging Wednesday thing is making me thirsty!